American broadcast journalist Mark Steines is a power to reckon with in the broadcasting industry. Best known for hosting celebrity news show, Entertainment Tonight for eight years and co-hosting the morning talk show, Home and Family, Stein’s keen interest in the broadcast business has helped him maintain a steady growth when compared to his counterparts. The Iowa native who is also an actor has received multiple awards for his performance in movies like Beyond Endurance: Madagascar, and Beyond Endurance: Borneo. He even won an award for hosting the 74th annual Hollywood Christmas Parade in 2005. Mark Stein has, no doubt earned all these through hard work and commitments and looking at his performance, the journalist-actor is heading for a career peak in the nearest future. Born on the 7th of June, 1964, in Dubuque, Iowa, Mark Anthony Steines grew up with his American parents and an older brother whose name is Mike. Mark attended Hempstead High School in Dubuque, Iowa, after which he received a football scholarship to the University of Northern Iowa where he graduated from with a B.A. in radio and television. Mark began his career as a reporter and photographer at KWWL-TV which is in Waterloo, Iowa. He later joined KSPR owned by Schurz Communications as a sports anchor until 1991. Moving higher in his career, he found himself in bigger broadcasting firms like the CBS TV Stations subsidiary, KCAL-TV which is based in Los Angeles, California, and the popular sports TV channel, ESPN. While working with KCAL as a substitute anchor and correspondent, Mark Stein’s impact on KCAL specials, earned him a Golden Mike award and two Emmys. Mark Steines’ acting career marked a debut in 1995 in the American biographical film, Nixon, where he acted as a White House Security. He would go on to record brilliant performances even as a minor role in the American TV soap opera, The Young and the Restless (usually abbreviated as Y&R). It was during this period that he joined Entertainment Tonight where he worked as the TV newsmagazine’s substitute anchor and correspondent, then later as the show’s co-host. Mark worked for seventeen years as ET’s co-anchor for Weekend, before leaving in 2012 to start the popular American talk show, Home and Family with Paige Davis. He was, however, fired from the series in June 2018 with the Hallmark Channel allegedly presenting vague reasons for doing so. Mark Steines removal from Hallmark Channel’s TV show, Home & Family became controversial after Steines laid a lawsuit against Hallmark Channel’s parent company, the Crown Media Family Networks, alleging that he was fired because of a statement he made that supports the two women who claimed they were sexually harassed by the show’s executive producer. In a case he filed in the Los Angeles Superior Court, in September 2018, Steins stated that the media company had him sidelined and had his salary cut before it finally fired him for supporting the women’s harassment claim by Fraser. Crown Media Family Networks did not only deny Steines’ claims but also released a statement saying that although it was a hard decision for them to take, they fired him because the show’s rating had drastically declined. 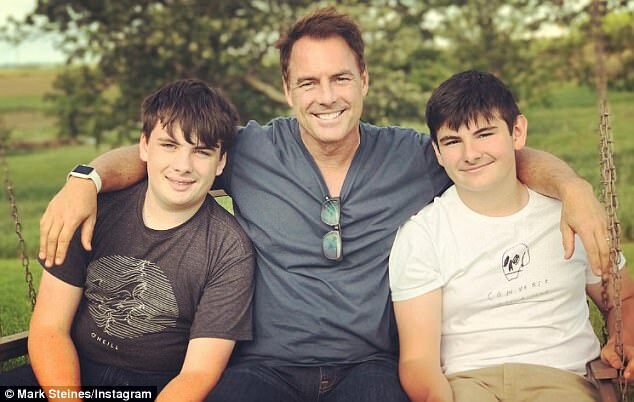 Since his bitter dissension with the entertainment channel, Mark Steines has not been seen with any channel yet. Possibly, he is busy building on his passion for photography. Steines is, however, very active on social media where he has thousands of followers. On Twitter, the journalist has over 19k followers while on his Instagram handle he has over 24k followers. See Also: Holly Sonders Bio Wiki, Is She Divorced, Married or Dating Erik Kuselias? Mark Steines is a married man. He married Eva Leanza Cornett on July 22, 1995. The two had dated for a long time before saying yes to each other in marriage. Although they are now separated after 17 years of marriage, the couple has two children namely Avery James (“AJ”) and Kai Harper. Leanza Cornett is a former correspondent for Entertainment Tonight correspondent and Miss America 1993. She was born in June 1971, in Big Stone Gap, Virginia, but she grew up in Florida. Combining her career as a TV personality with a beauty pageant, Cornett has also hosted other notable shows like New Attitudes and Who Wants to Marry a Multi-Millionaire? She was replaced by her husband Steines after she was let go by the ET a few weeks after their wedding. For someone who has attained such a great height in his career, it wouldn’t be a surprise to see Mark Steines ranking among top wealthy celebrities. The TV star’s net worth is estimated at $20 million, an amount he accumulated from his stellar jobs on radio, television programmes and in acting. Steines is also believed to be earning about $38,768 annually which is quite huge. Apart from being very hard working and self-disciplined with his work, the 6feet tall journalist lives a life of luxury. His five-bedroom home in Ojai, California is a good proof of this fact. The house is reportedly worth about $2.3 million.